President Buhari on Monday said that all unclaimed looted assets including landed properties recovered by the Federal Government would be sold and the proceeds will be deposited into government treasury. The President made this known when he addressed members of the Daura Emirate coalition who paid him a condolence visit at his country home, Daura, Katsina state. 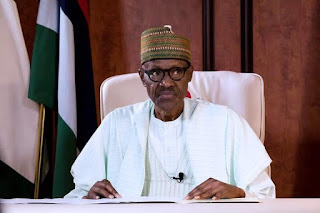 President Buhari noted that many suspected looters of government resources had been denying ownership of their ill-gotten properties and assets across the country. He stated that he was not surprised by the increasing number of those denying ownership or disclaiming the properties traced to them by the various anti-corruption agencies. “Some years back one of my schoolmates in the primary school who worked at a cottage company before his demise predicted that we will come to a situation when looters will deny their loots in Nigeria. “So as a civil servant, you have 10 houses in Abuja and even in Kaduna and abroad, the more you show them the properties the more they will swear that it does not belong to them. “And we are still following the process, you know democracy you have to follow due process and respect the rule of law. “If the money is in the government treasury I will see who will come back after we left and reclaim them,’’ he said. The president pledged that government would ensure availability of fertilizer and other farm inputs to farmers to sustain the successes recorded by the farmers in the previous farming seasons. He said: “Please tell Nigerians that we are trying our best, and I thank God, the rainy season is blossom, we will try to add more money to farmers, and ensure the availability of fertilizer and other farm inputs. The leader of the coalition, Muhammed Sale told the President that they were in his resident to condole with him over the death of his two relatives.